Most of the time living in Cambodia, I don’t feel like I am making huge sacrifices for God. In fact, I’ve found many things to love about living here. I’ve discussed this before, and in a future post, I plan to discuss more specifics about the joys of our life here. I am so happy here that I sometimes forget that other people have made sacrifices for me to be here. Reminders come in the form of my children, when they miss the family and friends they’ve left behind in America. They come in the form of Skype sessions with my parents, when I realize anew how very much they miss us. So I am sandwiched in the middle of two generations of people who have, in many ways, sacrificed more than I have – much more. My parents. My children. I have caused people I love to suffer. And I did it voluntarily. You might not hear many people talking about this. You are more likely to hear people talk about the sacrifices of the missionaries themselves (whether or not it’s a missionary who is speaking). But I think that does an incredible injustice to the thousands of people in America who are sacrificing right now to send a loved one overseas. Last year, Elizabeth and Jonathan and their foursome said goodbye to their families and friends and flew toward the adventure God chose for them. Those left behind, with none of the distractions of a new culture, slowly adjusted to their absence. The Trotters were missing from the daily landscape of our lives, and knowing this was going to happen didn’t make it less painful. At first when they left, I kept forgetting. I’d pick up the phone, punch in their number and sheepishly hang up. Or I would think I saw Elizabeth coming out of the library and wave too warmly at a confused stranger. It was like when you rearrange the contents of your kitchen cabinets and spend the next four weeks trying to relearn where you store the salt. Things weren’t where they were supposed to be. Their pew at church was too empty. No squirmy bodies next to Elizabeth’s mother, Mary, munching on grandma’s snacks and vying for grandpa’s lap. Those first few months were hard on the families stateside, especially as news of distress and health crises came their way. Powerless to help, family prayed. A missionary wife once told me she hadn’t understood what the extended family sacrificed when she and her husband left for the mission field. She had since come to see that they relinquished precious time with their children and grandchildren, forfeited shared memories of celebrations and milestones, and suppressed their instinct to rescue when things went wrong. If you have to say goodbye, this is the century to do it in. My grandmother had a dear friend who was a missionary with her husband in Burma during the 1950’s. Somehow they held their friendship together with letters and furloughs, and in the long silences between, they prayed. Facebook, Skype, blogs, email have closed gaps. Within the digital universe, both sides of the ocean can post photos and videos and updates. Elizabeth can share funny stories about the kids, so women back home can “watch” them grow. To celebrate their special days, one can browse their Amazon Wish Lists to find a gift, or select something from itunes. Even international travel is more feasible than it once was. Visits are possible. Nothing substitutes for presence. These days, I can’t sit next to the bathtub and hold Faith while Elizabeth brushes the boys’ teeth. I can’t watch the boys wrestle or Hannah belly-surf down the stairs. I can’t go to a girly movie with Elizabeth and rehash our favorite parts on the drive home. I can’t watch her eat the frosting from the top of a cupcake and leave the rest because she only eats the part she wants. I can’t hug her. I concentrate on what I can do. I translate twelve hours ahead and try to anticipate what they might need. 1 p.m. here? Asleep there. I pray that the girls aren’t waking them in the night, that their colds will soon be gone. I pray that they will be able to play outside every day this week. That Elizabeth can find hummus at Lucky’s grocery store. I pray the details. I can look over Elizabeth’s shoulder and see the frontlines of world missions and watch God’s plans unfold. I can see what the Holy Spirit has done in her, enabling her to do things I wasn’t at all sure she could do. (Bugs, germs, smells, change in all forms.) And through her blogging, the special qualities I knew were inside her are out where others can see (humor, insight, modesty in all its expressions). Perhaps it sounds overdramatic, but I’ve concluded that for me, missing my missionary friends is a standing invitation to resubmit to God’s plans. My true and proper worship. Awesome! I appreciate your insights… It’s all so true. We totally understand as we have moved so far away too and our friends and family have sacrificed for our ministry. I see our sacrifices most in our kids as well as they miss their friends so much it hurts. But we know that God is doing work in their hearts through this experience and they are learning to trust. We all are, eh? And Canadian speech is rubbing off on you, eh? 🙂 In all seriousness, though, the burden of knowing that I am responsible for such deep pain weighs heavily on me at times. It makes me wonder how the Father felt about being responsible for His Son’s pain. At the end of the day, I am here because I am trying to follow God, and you are in Canada because you are trying to follow God. . . and sometimes He asks us to do hard things. Oh, wow. This is beautiful. As someone who longs to be on the mission field (and in Cambodia, of all places), this is sobering to think of the people we’ll leave behind. Hugs to you both! Hi Marla. It’s really nice to meet you. 🙂 I hopped on over to your website to find out about your plans/dreams regarding Cambodia. I appreciated your 4 part What About Orphanages? series. Do you have a tentative departure date? I also remember my own mother crying tears of joy when I told her I was going to New Zealand as a missionary. How long were you in New Zealand, Jerry? Are you still there? Brillant article (as always) Teresa!! I feel so blessed to personally know both of these Godly women!! You inspire me and encourage me!! From near…….and far!! I agree, Pam. Teresa amazes me too! Dittos to your mom’s comment. As the mother of a child on the field, it is all so true. Thank you Elizabeth for speaking for both sides. I think the sacrifice the senders give and their experiences are often forgotten – both the pride as well as the pain. As the Mom of an amazing young woman, who is on her third year serving in South Africa with her husband, I was greatly moved by this. We are so thrilled that she is following the call from God, yet miss her greatly. It is only intensified now by the arrival of a baby girl. I will not hold my grand child for the first time until she is 8 month old. Sometimes the best things are not the easiest. Our best “couple-friends” are on the path to becoming missionaries in France, and we have dreams of leaving for the world-missions field at some point. “No squirmy bodies next to Elizabeth’s mother…” That’s going to HAPPEN. First, we will be the observers as our dear friends go, but eventually it could be MY mom, MY friend picking up the phone to call. 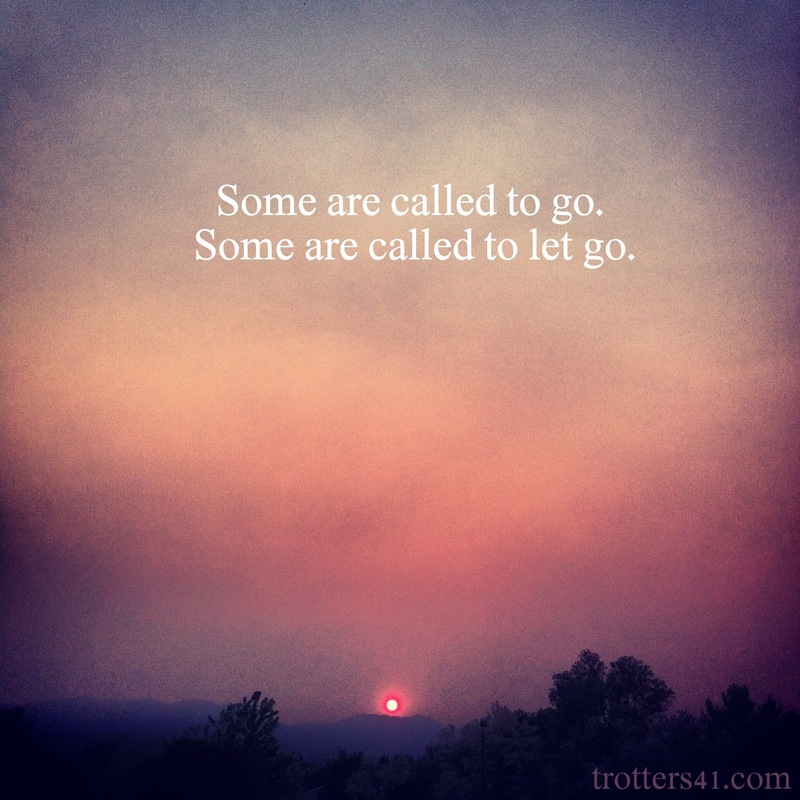 This is so beautifully written and such an appropriate reminder to those who are called to let go. I just found this post…..nearly 2 years after its writing. I remember when I told my best friend that God had called me to Cambodia. She said “I know you, and I know this is true. God has called you. And it is wonderful”. And we cried. She has been totally supportive from day one. But she too had to pay a price. I came back for my son’s wedding this month. Sad that I had not previously met his love. Sad that I have no history with them as a couple. He is sad that I will likely not be here when they have their first child. My granddaughter and I are close, and my daughter is sad that I am not here for them, but she understands the greater call. In the midst of the sorrow, I have to be honest, there is much grace, peace and joy. Sorrow sandwich. So aptly named. Your friend said, “God has called you. And it is wonderful.” And then, she cried. She supported, and supports, you through tears. Wow. What.a.friend. She is a gift to you! And that friendship is a costly gift. Grace, peace, and joy to you and your loved ones in the midst of the emotional wreckage of separations. Thank you for sharing these stories. I don’t think it ever gets easier, and sometimes we forget that. It is good to remind ourselves. Thank you for reminding me today. This one is a real tear-jerker. I remember when I finally recognized the cost for the generations I’m in between. It was wrenching. The letter from Teresa is so, so good. It is a real tear-jerker, isn’t it? It’s been 3 years since my friend wrote this, and I still value her friendship more than any other relationship besides my husband’s. And I’m still stuck in between. . . Thanks for sharing this on the link-up with Velvet Ashes today, Elizabeth. I hadn’t seen it before. I’ve been spending the afternoon crying while reading these link-ups. So powerful! What a precious friend. And the idea of a sorrow sandwich… yep, that resonates a little too deeply. Thanks for sharing, Elizabeth.